The year 2016 threw a slight curve my way when the first weekend in May ended up being the 1st of May. A really excellent trail race I love to run called Pick your Poison which is usually a weekend before the Goodlife Fitness Toronto Marathon ended up being the day before the marathon! This left me with the dilemma of either missing the 50K trail race or missing the marathon which really wasn't an option. 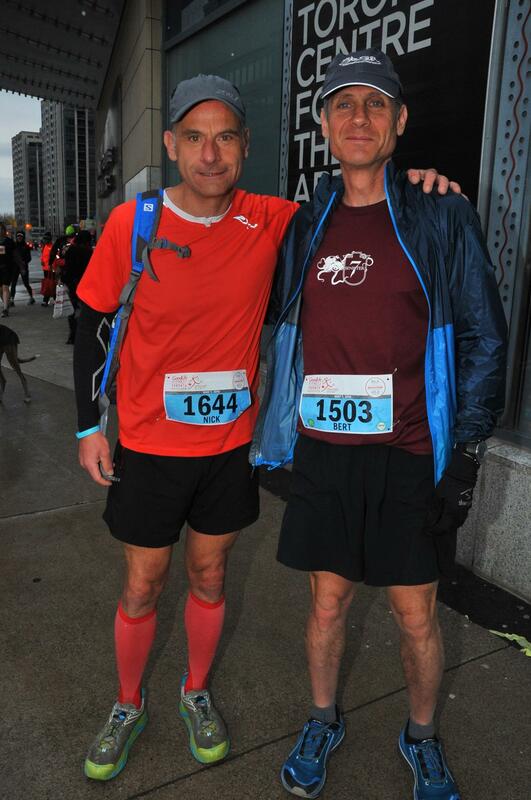 I do the website for the Toronto Marathon and the race director is my partner in the Collingwood Half Marathon. My entry was free and I wouldn't miss race weekend. So of course I had to do the races back to back to use them as a training weekend. After posting my intention to run two significant races back to back on Facebook, my ultra running friend Bert Starke took notice. Within about 2 minutes he had decided that he was in for this crazy adventure as well! 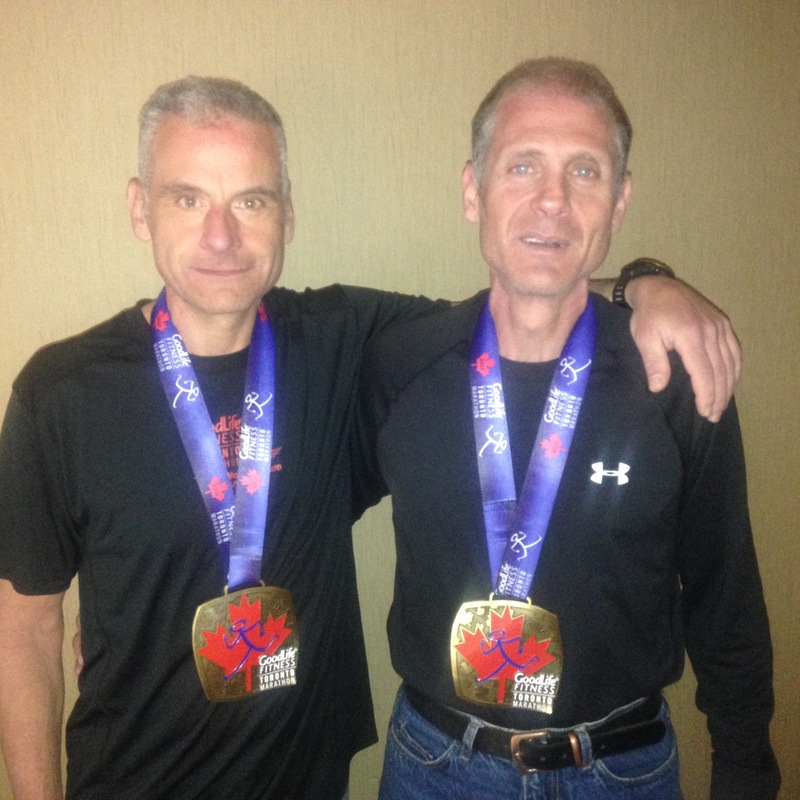 Bert, a paramedic in Calgary, Alberta was going to be visiting family in Montreal and Ottawa anyway so decided it would be worth the drive to meet me for these races. 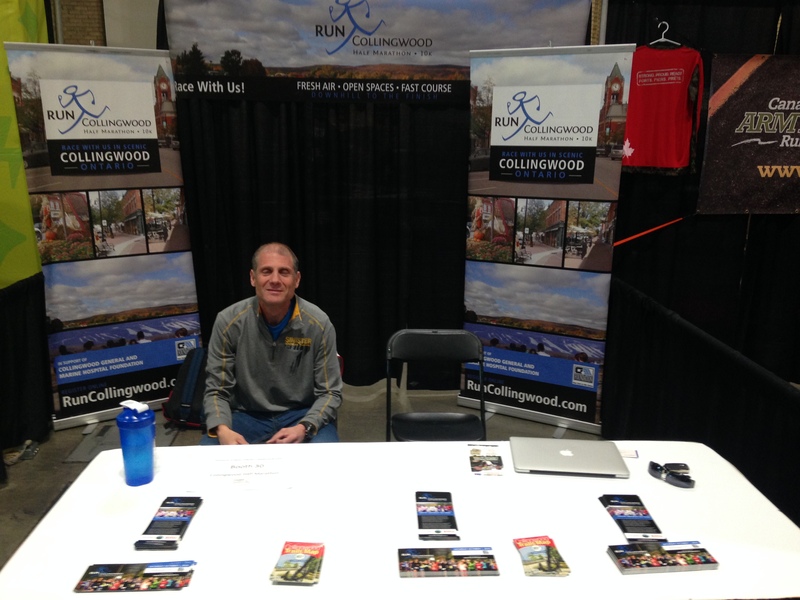 In order to promote the Collingwood Half Marathon, I worked at a booth Friday at the Toronto Marathon expo. Bert happily jumped in to help greeting all sorts of runners from all over the world. 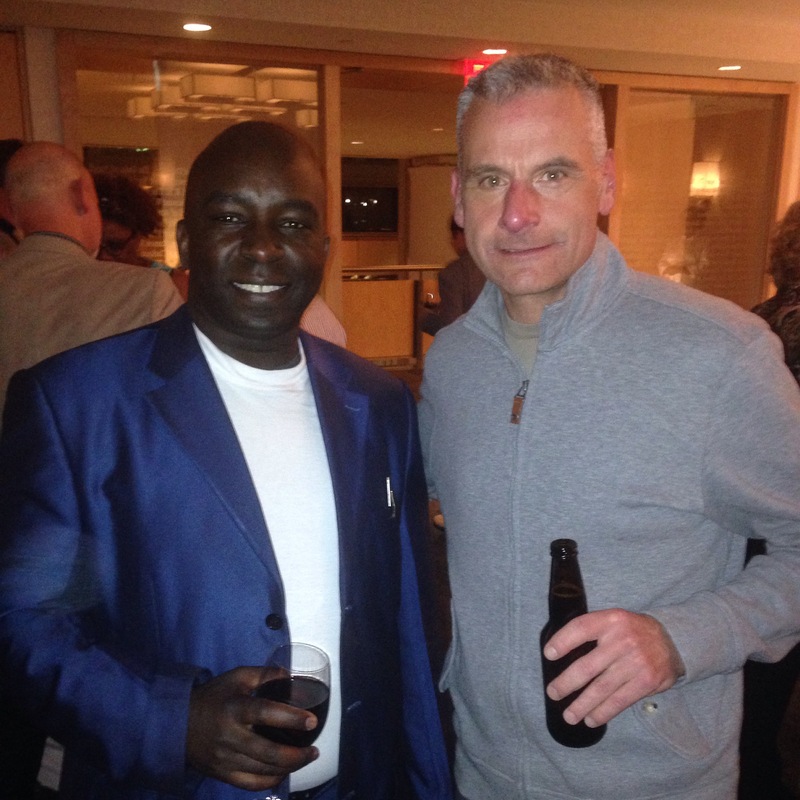 Later that evening we were guests of the race director's reception where I had a chance to catch up with everyone including my Kenyan elite athletes that I coach and several other race directors and organizers. After the reception it was off to bed for us to wake up early for the drive to Horseshoe Valley for the Pick your Poison trail race. My son Tom was primed and ready to take over the booth for us Saturday. The Pick your Poison trail race is aptly named because you can pick 12.5 km, 25 km or 50km by doing 1, 2 or 4 laps of the course. The course is located at a private ski club and is incredibly hilly, technical, and can include some late spring corn snow. This year we had the driest conditions I remember, pleasant warm sunshine and no corn snow! I had thought I'd have my new PR on the course but it was not to be. On leg 4 about 43 km into the race I develop severe groin cramps as well as calf cramps. This resulted in my 5:20 target time being turned into a 5:55 cramp walk off. I persisted though and finished the race. As for Bert, he had a super fast race finishing in just under 5:15 with none of the cramp issues. His Icebug shoes with the tiny spikes were basically overkill as the course served up amazing conditions. Pick your Poison is one of the Ontario Ultra Series races and certainly deserves your attention. You will be pleased with the organization of the event with well stocked aid tables, 3 of which are on course. The friendly crowd of runners and volunteers feels like family. Race director Adam Hill who is an excellent ultra runner himself really cares and puts on an excellent event. Bert and I hurried back to Toronto to get a good night's sleep and some carbs to prepare for the marathon in the morning! Morning had come very quickly for Bert and I as we woke to a persistent rain and cold conditions in Toronto. We managed to drag ourselves out of bed, consume some carb and load up for the shuttle bus to the starting line. 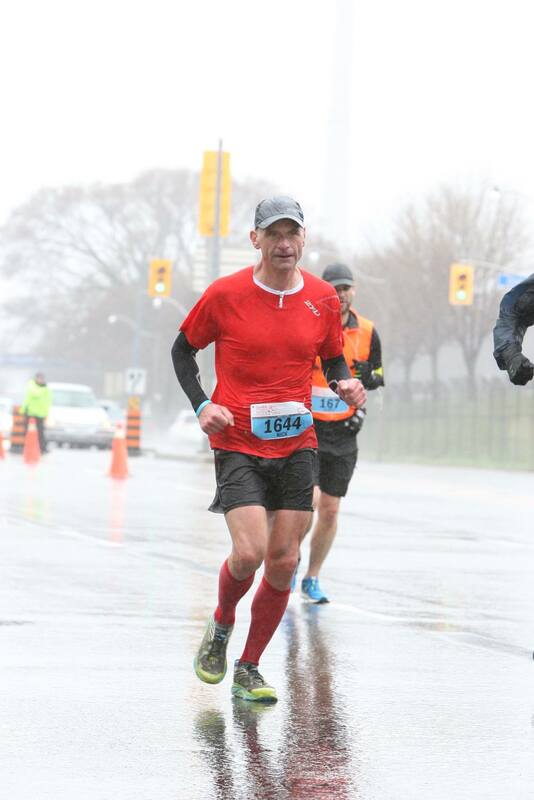 Our intention was to simply use the race as a training run for our 100 mile race coming in July as well as afford an opportunity for me to give Bert a tour of Toronto on foot. The Goodlife Fitness Toronto Marathon is by far the most scenic marathon with the most historical landmarks in Toronto. As long as we came in under 4 hours we really had no pressure. We also ran into my friends Yvonne and Marie who were also out braving the elements to finish yet another marathon. Camaraderie is one of the beautiful aspects of running! We arrived at the starting line where I met up with one of the women I coach (Natalie). Nat was feeling the nerves of race morning and hoping to hit my A goal time of 3:30. I calmed her nerves and let her get into the mental zone and concentrate on what she had to accomplish. Bert and I were feeling surprisingly fresh considering we had finished a 50k trail race a mere 17 hours earlier. We went out and began thoroughly enjoying the race with the enthusiastic supporters cheering us along despite the rain for most of the course. It is really quite touching when so many people brave the elements to stand in the rain and cheer. We had a few highs and lows where pace would increase then decrease. I continued my travelogue of the city for Bert naming such landmarks as Casa Loma, the Rosedale Valley, St. Lawrence Market, the waterfront etc. We continued this banter and enjoyed the light misting rain until all hell broke loose! We were 8 km from the finish coming back from the Humberview Park turnaround running into a crazy wind with gusts that threatened to blow our running hats off. The temperature had dropped and the rain intensified to the point where it seemed like we have gone swimming in our running clothes. At that point it became a simple matter of trading the suffering out on the course for a feeling of just wanting to get it over with. Our pace had actually picked up in those last kilometres as a result. With 500 metres to go the cheering had become deafening! Not only the enthusiastic students working the hydration tables, but the general public at Ontario Place had swelled to the point where it was a roar. Bert had said thank you so many times along the way because it was such an uplifting race and he was so happy to be there. We rounded the last turn and crossed the timing mat with our hands in the air celebrating putting 50k of trail and 42.2k of road behind us within 24 hours! the 92.2k weekend was in the books. As for my athlete Natalie, she nailed my assigned A time within 24 seconds! 3:30 was hers and she could not be more happy. I could not be more proud! After the race our core temperatures plummeted and we immediately headed to the medical tent where the nurses assessed us and wrapped us in hospital blankets and hugs near the heaters. After a shuttle ride back to the Hilton we had the best hot showers ever in our lives. We parted ways as Bert drove to Ottawa to his sister's place and my son Tom and I drove home to Collingwood but not without a stop first! Heading home after the marathon my son Tom and I stopped at Sammy Chumba's for the traditional Kenyan staple dish of Ugali. 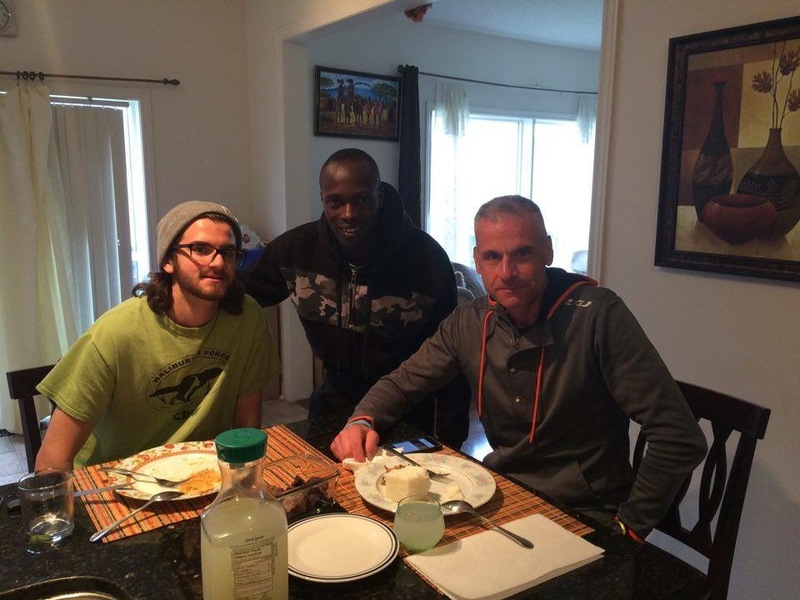 Sammy was 2nd place with a 2:23 time last year at Toronto Marathon and was on pace to win this year but sadly developed some calf cramps due to the cold weather which was not something he is used to. Ugali is made with corn flour some salt and water. It's boiled to form a solid cake and is often served with vegetable stew and meat when available. As a no meat athlete I was happy to eat the Ugali and vegetables. 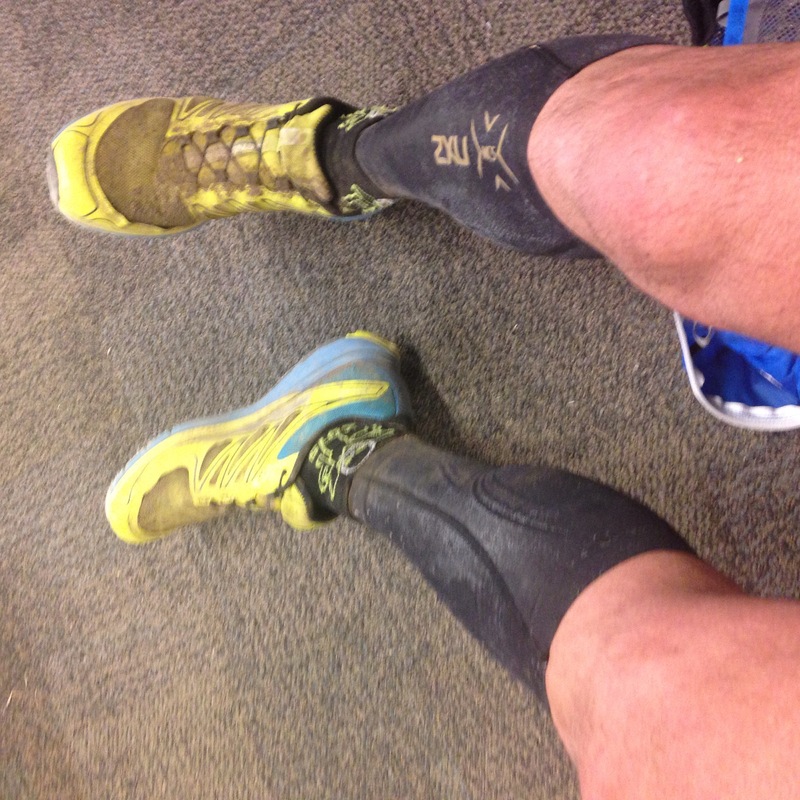 This sort of weekend is certainly not the usual thing for most runners. 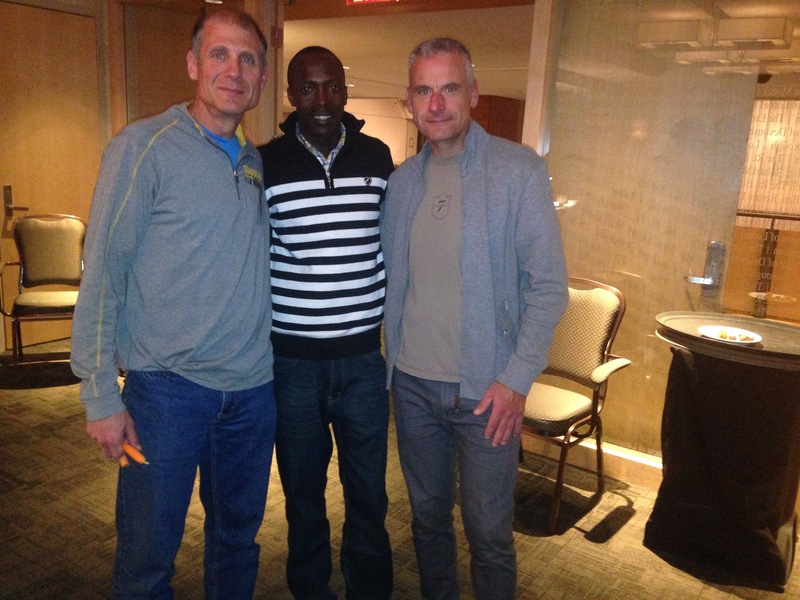 In fact most marathoners taper for a week or two before the event to come into it fresh. Could Bert and I have run the marathon half an hour faster? Sure! But in this case it was more about solid back to back runs to prepare for 100 miles. It's the sort of quality training that must be done to survive that distance. 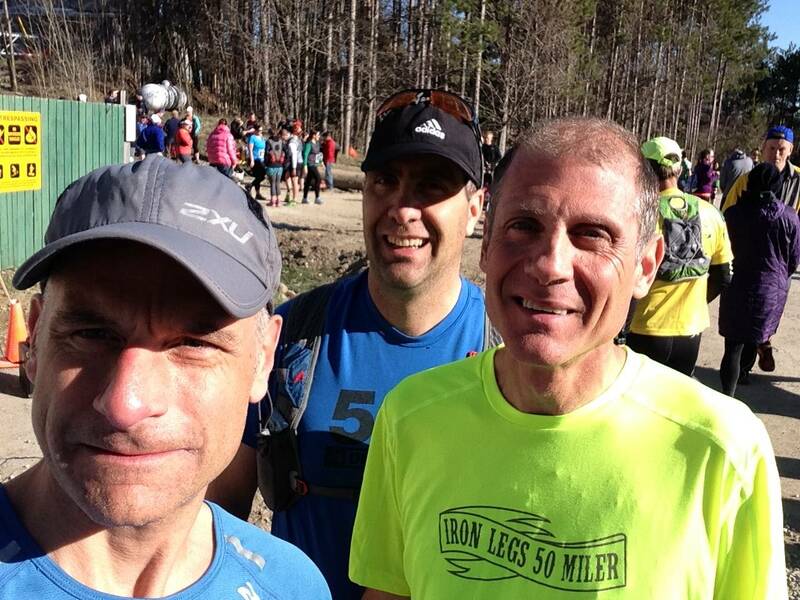 We will definitely have another crazy weekend like this but until then, I'll see Bert again in July as we run the Sinister 7 100 mile trail race in the Crowsnest Pass Alberta. Got a race story you would like to tell? Please email info@myactivelifetime.com to feature it here!